Communism, or as Ken Jowitt prefers, Leninism, has attracted, repelled, mystified, and terrified millions for nearly a century. 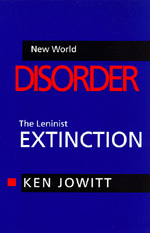 In his brilliant, timely, and controversial study, New World Disorder, Jowitt identifies and interprets the extraordinary character of Leninist regimes, their political corruption, extinction, and highly unsettling legacy. Earlier attempts to grasp the essence of Leninism have treated the Soviet experience as either a variant of or alien to Western history, an approach that robs Leninism of much of its intriguing novelty. Jowitt instead takes a "polytheist" approach, Weberian in tenor and terms, comparing the Leninist to the liberal experience in the West, rather than assimilating it or alienating it. Approaching the Leninist phenomenon in these terms and spirit emphasizes how powerful the imperatives set by the West for the rest of the world are as sources of emulation, assimilation, rejection, and adaptation; how unyielding premodern forms of identification, organization, and action are; how novel, powerful, and dangerous charisma as a mode of organized indentity and action can be. The progression from essay to essay is lucid and coherent. The first six essays reject the fundamental assumptions about social change that inform the work of modernization theorists. Written between 1974 and 1990, they are, we know now, startingly prescient. The last three essays, written in early 1991, are the most controversial: they will be called alarmist, pessimistic, apocalyptic. They challenge the complacent, optimistic, and self-serving belief that the world is being decisively shaped in the image of the West—that the end of history is at hand. Ken Jowitt is Professor of Political Science and University Distinguished Teacher at the University of California, Berkeley.